Turkish superyacht builder Turquoise currently has two yachts under construction: a 47m known as NB60 and its new 77m flagship known as NB63. The 77m NB63 has an exterior and interior designed by H2 Design and is based on the award winning 72m superyacht Vicky launched in 2012 and also designed by H2. NB63 rendering by Turquoise Yachts. According to Turquoise, NB63 has more exterior space than other yachts in its class. The exterior living areas boast features such as a 5m swimming pool complete with a waterfall. There is also a large sunbathing area and an open sports gym area. 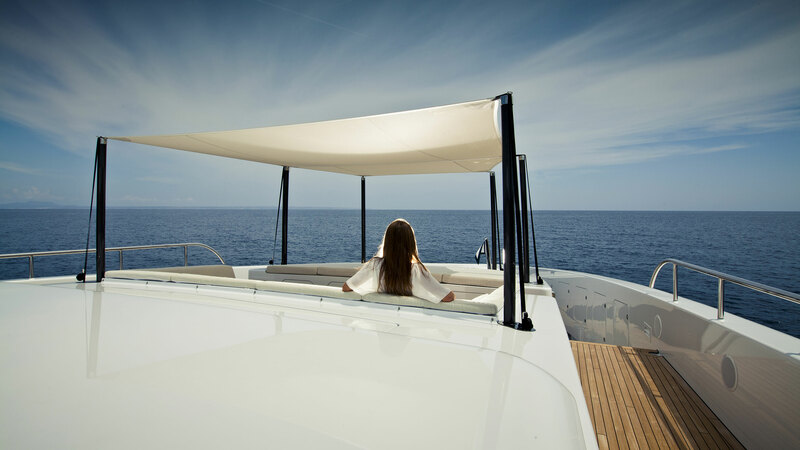 The crowning jewel of NB63’s exterior living areas is a large transom beach club. Accommodations inside NB63 are just as impressive. The owner’s suite alone encompasses 100 square meters (a little more than 1000 square feet) ensuring a private enclave that can be retreated to at any time. In total there are luxurious sleeping arrangements for up to 18 guests in nine staterooms. There are additional accommodations for us to 20 crew members to ensure the guests and owners are well taken care of. The crew even has access to its own gym as well as two lounge areas.